Even though I am not writing that much these days, I am still reading like a madman to keep myself up to date on upcoming technologies. 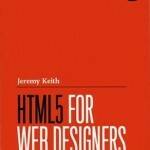 On thing I was not looking forward to reading was the 900+ page spec on HTML5. Thankfully, a book I have just recently finished helped solve this problem, so I thought it deserves a few words.